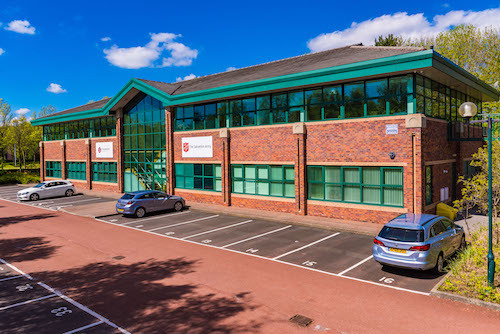 This building forms part of Cygnet Court on Centre Park, Warrington, which is a southern extension to the Town Centre and comprises quality office accomondation in a mature and attractive landscaped environment. Cygnet Court is a courtyard of six individual office buildings situated close to the entrance of the park with 210 having a prominent position fronting Lakeside Drive, the main loop road through the Park. Centre Park’s onsite ammenities include the Village Hotel and Leisure Club, Premier Inn Hotel and Beefeater Restaurant. 210 is only a short walk from the heart of the Town Centre and all its ammenties including the Golden Square shopping centre. It is also within walking distance to both Warrington Bank Quay and Warrington Central Train Stations. By car Centre Park is accessed from the A49, a major arterial route running along the eastern edge of the Town Centre providing direct, efficient access to junction 9 of the M62 and junction 10 of the M56 motorways.